Lamberts® Vitamin D 4000iu provides 100µg of this important nutrient in the preferred D3 form and at a strength that is increasingly being recommended to correct deficiencies. These easy to swallow capsules are made in the UK to pharmaceutical GMP standards. In the UK, the only significant food source of vitamin D is oily fish. Most of our vitamin D comes from the sun. But there is a problem: many people in the UK never get what they need from sunlight alone because sunlight’s ability to help us produce vitamin D is hampered by season (it only works in the summer), latitude (the UK is pretty far north), time of day (needs to be between 11am and 3pm), cloud cover (complete cloud cover reduces vitamin D synthesis by 50%), smog/pollution (most of us live in cities), skin melanin content (the darker skinned you are, the less vitamin D you’ll get from the sun) and sunscreen (SPF of 8 and above). Even in summer, when vitamin D is most available, it is estimated that 45% of the English population have vitamin D levels of less than 40nmol/L (deficient) and that 75% fail to reach the ‘optimal’ level of 75nmol/L. The natural Vitamin D3 in this product is the same form produced by the body when the skin is exposed to sunlight. 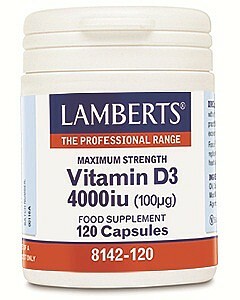 Use of Lamberts® 4000iu Vitamin D3 requires specialist knowledge. This product is suitable for all adults. Take 1 capsule daily with a meal. Do not exceed recommended daily dose. Food supplements should not be substitute for a varied diet. This product is free from wheat, yeast, dairy, soya, nuts, shellfish and Gluten containing ingredients. None known at ecommended usage. Not recommended for long term usage. Storage Insuructions To be stored in a cool dry place and protected from light.